1. Sephora by OPI - Metro Chic. The most popular muddy taupe shade (and the one that started the trend), Metro Chic has been my nail polish of choice for the past few months. I'm nore than halfway through it and it's still a nice one to work with: it hasn't gone too gloopy and it delivers an opaque finish after 2 coats. 2. 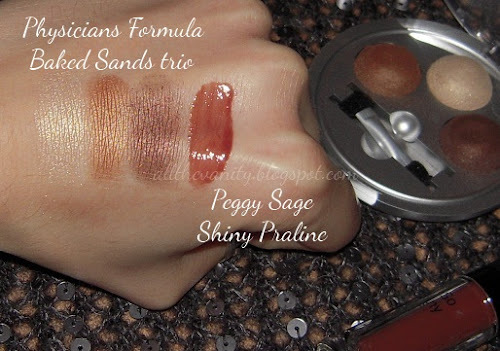 Physicians Formula "Baked Sands" Trio. 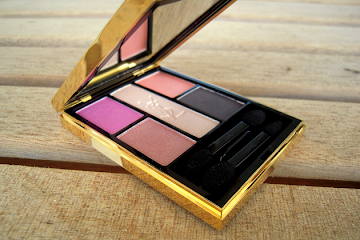 This was a tough one to hunt down online, and with good reason, since it's a very flattering neutral palette. 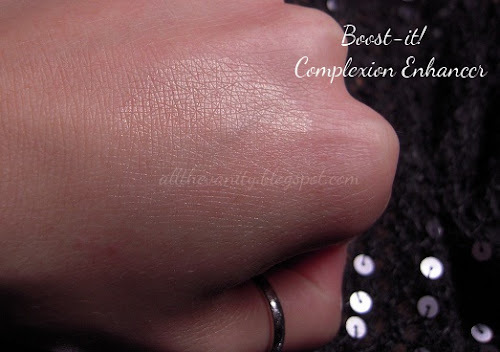 As you can see from the swatches below, the colours are nicely pigmented and ideal for fall. I can see this working for a large variety of skintones, from the very fair to the darker medium ones. Great value for money too (as it seems to be the case with many PF products). 3. Peggy Sage lipgloss - "Shiny Praline". Another fall colour choice of mine (can you see the autumnal leaves palette I was trying to recreate? ), Shiny Praline is a chocolate rose shade with a creme finish. 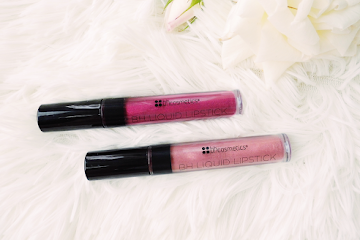 Being not too familiar with this brand (thank you Blushingloves), I'm happy to share that their lipglosses aren't sticky at all. I would have preferred it though if the formula was a bit thicker and not as watery. 4. Luminess Air "Boost-it!" complexion enhancer. I came across this product completely by accident: it was an extra thrown in in a MUA swap. Despite having not heard of its existence before, the description intrigued me: "a complexion enhancer that instantly tightens and brightens the appearance of skin". And it does exactly that: I apply it prior to my foundation (as recommended - I found that mixing it with the foundation doesn't deliver quite the same results) and it gives a lovely subtle glow to my complexion. This was extremely hard to photograph and I'm afraid that the swatch gives the wrongful impression of a more frosted finish. I've been looking for a liquid illuminator for a while now and this one definitely covers my needs. If you're familiar with this product pls drop me a comment below, I'd love to hear your thoughts! 5. The Body Shop Coconut Oil Hair Shine. The last product is a bit of a paradox: a favourite, that isn't really a favourite. I feel that this product is largely overhyped: I still fail to see if it nourishes my hair in the slightest bit. It is winter however, and my Hei Poa oils have gone solid, which means that warming them up to make them usable requires an effort - not happening when you're in a hurry. So, this has been the next best choice when you just need a little something to keep your hair in check after a blow-out. It's a nice alternative to those silicone drops (the extended use of which actually dries your hair out even more), but by no means expect any miraculous results from it. 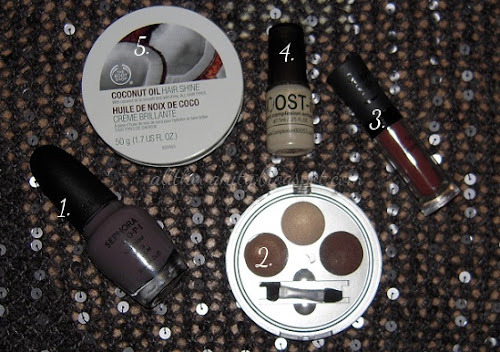 So, those were the products lurking inside my makeup bag recently. Any ones you've tried yourselves? What are you currently using on a daily basis? Ποσο ζηλευω το Sephora by OPI! !Δεν υπαρχουν Ελλαδα ετσι? Απιστευτο χρωμα!! Η παλετα επισης τελεια! Λατρευω τα χρωματα αυτα! Peggy Sage!Εχεις δοκιμασει κ αλλα προιοντα?Ειναι καλα?Μενω πολυ κοντα στο καινουργιο μαγαζι τους κ σκεφτομαι να δοκιμασω κατι..καμια προταση? To mano exei apisteuto xrwma! I have been using the Metro Chic almost all fall.Now I'm into more vampy colors. You can try pure coconut oil on your hair instead of the body shop one.It works wonders on mine. Physicians Formula has some nice palettes and I agree that the "Baked Sands" Trio is flattering on any skin tone. Great swatches! I'm drawn to Body Shop products because of their yummy scents! I don't think there's any of their products that I rave about in terms of quality alone....so I'm not surprised if you feel that the Coconut hair shine is overhyped. @beautyincrisis: Χρόνια πολλά κορίτσι και καλή Πρωτοχρονιά να έχουμε!!! 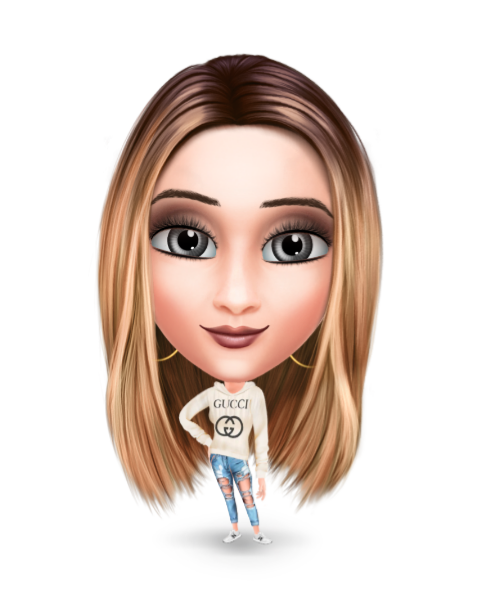 @Karen Law: Hey hunni!!! I'm well, had a lovely time this Christmas, and now hoping the same for the New Year! :) Ah, wish u could get on twitter finally, then I'd b able to tell u more abt it!!! Ayto to Peggy Sage lipgloss... τελειοο! φαινεται ζουμερο xD και η παλετα φοβερη, πραγματικα τα χρωματα ταιριαζουν σχεδον σε ολες!